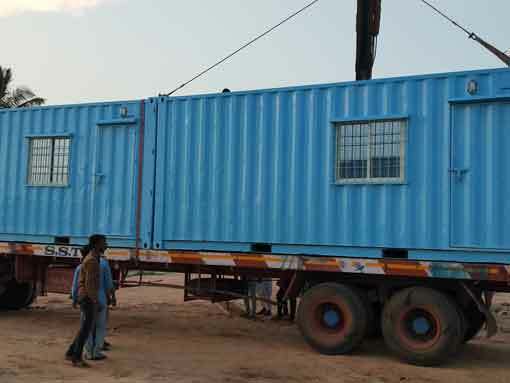 SAMAN Portable is among India’s top supplier of Kitchen Containers including a comprehensive range of prefab structures to residential and commercial sectors. Since our inception, we managed to establish a prominent reputation in the field, by providing premium quality products at an affordable cost. We deal with ACP portable containers, porta toilets, Portable homes, Prefab industrial shed, Container Shed, Kitchen Container and many more. Irrespective of the size of the home, a kitchen plays a significant role in enhancing the aesthetic values of a place. A kitchen is a place where happy memories are made. At SAMAN Portables, we offer customized modular kitchen containers featuring high-end functionalities. 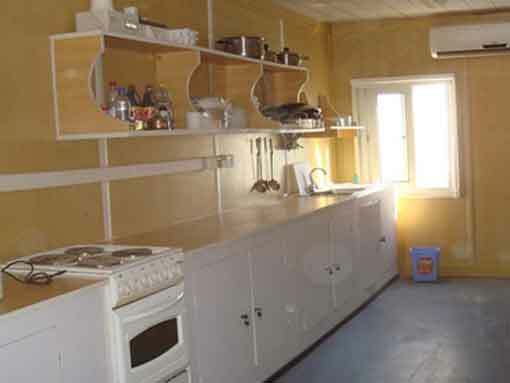 With our kitchen container, users can have a contemporary kitchen with modern amenities, with minimum investment. Contrary to traditional permanent built kitchens, our modular kitchen can do the task within a tremendously lower price. We provide a wide range of layouts and a combination of layouts to choose from. If you have a custom layout, we provide that facility as well. 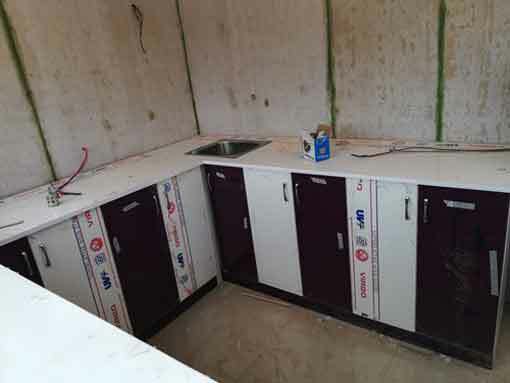 What makes our Kitchen Container worthy is its flexible layout patterns and an extensive range of customized installation points such as cabinets, chimney, sink, hand basin and many more. If you are planning to rebuilt or construct an elegant and lavish modular kitchen, then feel free to give us a call. You can discuss your layout plans with our designers and they will deliver them at the shortest turnaround time. Need help with design? Don’t worry! Our Interior specialist would love to plan you your dream kitchen. With our customized kitchen container, you can avail a large amount of storage area with a confined space. Catering to a diverse customer base for years, our team of experienced professionals knows how to customize a storage unit that offers optimum storage area with a small space. Based on your choice and requirement, we can build you a floor to ceiling height of the pull-out cabinet, enabling you to utilize every part of our storage unit. You can also choose to install overhead storage cabinets to add some extra space within your kitchen Container. We ensure you an aesthetically appealing and ergonomically viable that perfectly fits the description of our contemporary modular kitchens. We offer a varied range of kitchen Container Designs at SAMAN Portable by analyzing the space of your kitchen and customizing them to their optimum usage. Our various size of kitchen plan includes A, C-, U-shaped Kitchen and many more. Moreover, we also consider the electrical points of your chimney, microwave, and other appliances and modify the kitchen ensuring proper safety and eliminating any chance of electrocution. 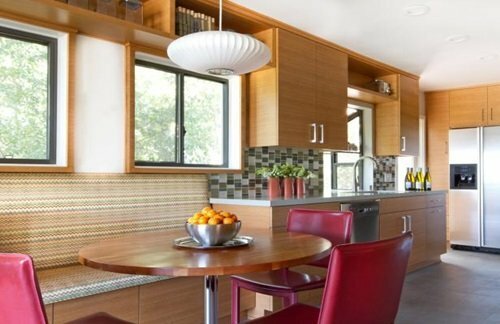 When we talk about materials, we not only consider the aesthetic features of a kitchen container but a kitchen that goes for an extended period of time. Apart from providing an impeccable premium look to the exterior, we also ensure a kitchen which offers optimum durability and convenience. We use eco-friendly ACP materials which are known for its robustness, corrosion resistance, water resistance, impact proof, and bacterial resistant properties. We follow a stringent procurement method with the help of our proficient procuring officer. All the end-products undergo a strict testing process before they are delivered to our customers. Whether you refurbish your kitchen or build a new one, you can ignore the money you bleed through your pocket. The cost of building a traditional kitchen is often higher than a modular kitchen. Building a traditional kitchen requires proper allocation of workforces and raw materials. Besides, the results not always match the idea which you have in your mind. 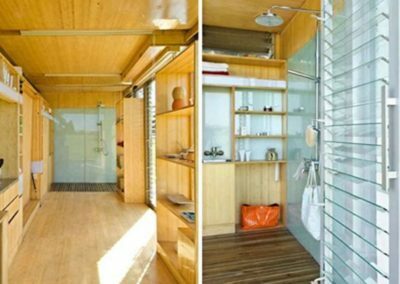 The best thing about our prefab kitchen container is its cost-efficiency and a varied option of layouts it offers. As all the parts of our kitchen containers come pre-manufactured, they don’t take any special skills to install. Also, you don’t need to reinvest in remodeling or renovating the kitchen. The foldable pieces of container kitchen make it easier to extend or dismantle as your needs. 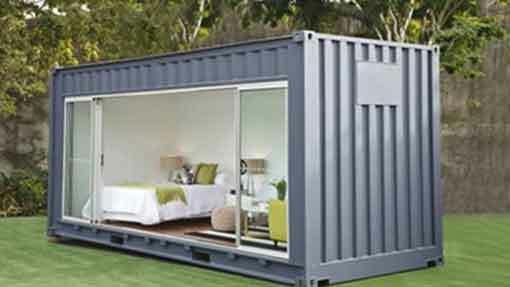 A prefab kitchen container is an ideal choice for a business that moves from one place to another. Our Kitchen container is quite popular among food truck owners, mobile homeowners, business owners who frequently travel etc. Our prefab kitchen reaches places which are impossible for a traditional brick and mortar structure. With our reusable and easily dismountable structures, Small businesses don’t have to miss out business opportunities due to investment costs. Our pre-engineered kitchen includes ultralight materials which make them easily transportable to any location. 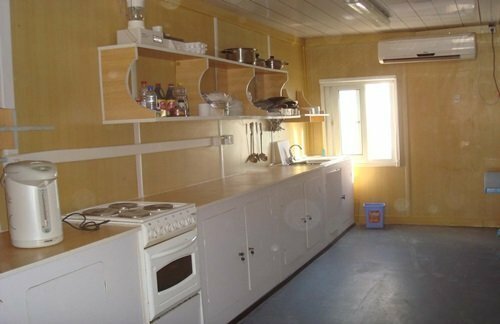 Our Kitchen Container consists of industrial grade ACP material and the ultramodern manufacturing technology in compliance with the International Standard of Safety. Our Kitchen Container has the ability to withstand the harsh weather and natural calamities like tornados, hurricanes, flood, earthquake, etc. Our kitchen Container is easily foldable and dismountable. It gives our client an opportunity to modify their kitchen as per their imagination. 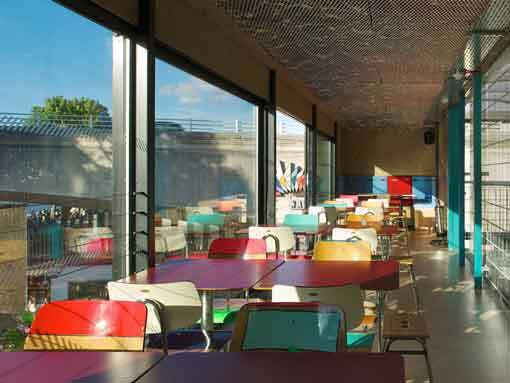 Also, you can accessorize the interiors and exteriors keeping up with the ambiance. While the exterior comes with lavish wooden-finish, the interior includes an exotic look. You can accessorize the interiors by adding some cool paint and wallpapers. Commercial businesses can add security cameras to add an extra layer to security. If you looking for a cost-effective Kitchen option for your house or business, then call us and get your dream kitchen built by SAMAN Portable. We offer limited deals for our lucky customers. So, pick up a call and get a price quote.